This is a new thing for me: making things for boys. I actually dread making baby gifts for friends that I know are having boys. What to make?!? Now that I have my own boy, it’s about time I get creative & make cool things for him. My cousin-in-law knit the most beautiful blanket, sweaters & leg warmers (I’ll be sharing later this week) and the lovely Amy gave me a skull teether (I’m in love). Other than that, Felix doesn’t have much of anything to call his own, yet. I’ve got to get cracking with little manly dolls & man-child outfits. I’ve got a few ideas for projects, but not many. Top on my list of things to make for Felix are baby blankets. Felix is a pansy about being cold, so he has to be swaddled in as many blankets as possible in order to stay happy. So far the only blankets he uses (besides the one my cousin-in-law made) are all pink. He needs more manly blankets! I bought some flannel last week, but got around to making a blanket today. I used a plain off-white flannel & an orange & white plaid. I had originally planned on plainly sewing the two pieces together, but that’s just not my style. I’m going to make these blankets as difficult on me as possible. I’m going to cut them up and then sew them together. It was simple enough & took just over an hour to complete. I have plans to quilt the whole thing, but my plans were foiled by my sewing machine which has decided to go on strike. I’ve got to take it in to get fixed. Every sewing project takes about twice as long because my thread keeps breaking. BLERG. “Man-child outfits” and calling your newborn son a “pansy” – you crack me up! 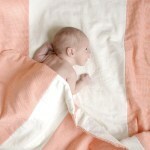 Love the blanket, andI’m sure Felix will be the most stylish pansy on the block in no time! Oh my gosh Felix is ADORABLE! Love the blanket you made! The orange and stripes are so fun. Hope your sewing machine repairs go smoothly. Oh what a sweet little guy! I too am new to the world of boy sewing (I have 3 girls) It is so fun to make things that aren’t pink & girly. Heads up on the machine::My machine was doing the same thing. A friend of mine that sews all the time helped me adjust the tension. She said after a few projects the tension will loosen & it can cause your threads to break. Hope that helps. i love that blanket. what a great idea to just alternate the strips. and felix is pretty cute too! Felix is just too cute! Love the blanket as well! 1. you are just amazing – already on projects so soon after the baby. i bow down to you. 2. yayyy for boy projects! 3. that blanket is so cool! he is adorable! i’m so excited for all the inspiration i’m going to gleam from your upcoming baby boy craft posts! my sister is due in a few months and i need to make her stuff. ps you just had a baby and you are making blankets! crazy awesomeness! Aw, Felix is so cute & he looks like so much fun already! I love simple projects that only take an hour. I can too impatient with long projects, and end up getting so irritated I have to stop for awhile. I haven’t learned the art of patience in crafting. Good luck–and Felix is beautiful! haha now you will have to adjust to blues and greens not pinks and purples, probably have already done that though! I think that will be a huge adjustment for me when I have a boy! Love the blanket! And I love the orange and white. I’m pretty sure everything my son owned was blue. Not so much as a hint of green in there… Partially (ok, maybe mostly) my fault, but now I love non-blue boy stuff! Melissa he is just so precious. And I am quite impressed with your crafty craftiness. Its fabulous. What a sweet little fellow you have there! Dude baby crafts…tricky. Freezer paper stenciled items, monster softies, funny shoes. That’s about all I’ve got. I definitely think you have to use your mind grapes when it comes to making stuff for the lil’ fellas. can’t wait to see what you bust out! Oh heck! Felix is so adorable! Plus, I adore that name! I’m a sucker for anything orange, so your blanket for Felix is awesome! when will we see his nursery? did i miss it? I want to see SO bad! Melissa! First off congratulations!! This is amazing, you are super woman, I tell ya! I don’t know how you have so many talents rolled up into one little person! Amazing, Felix is so cute. Love boy crafts!